Into the far north we shall take you... as far as we can by the means of computer role playing. Developed by Finnish indie team Enormous Elk, Unreal World is a computer role-playing game with roguelike elements about survival in a mythologized iron-age Finland. The player must struggle against starvation, thirst, dangerous animals, the vicious Njerpez raiders, and greatest of all, the winter. On the other hand, there are many possibilities: Building your own log cabin, making a long multi-kilometer fence of traps, raising a hunting party, eradicating enemy villages, and more. It recently became a free donationware game available at the official website . Not to be confused with the FPS series created by Epic Games (or their namesake game engines, for that matter). Abandonware: Gloriously averted. The game was first released in 1992, and still receives regular updates to this day. It even got named the "game with longest update history" in the 2017 Gamer's Edition of the Guinness Book of Records. Always Chaotic Evil: The Njerpez raiders, who attack all non-Njerpez on sight. They are also the only faction in the game to practice slavery. An Axe to Grind: Along with knives, axes are some of the most necessary and most versatile tools and weapons in the game. Though you probably won't be doing much fighting against people in most of your playthroughs, virtually all axes can be used as potent weapons when need be, in addition to common timbercraft and carpentry tasks. You can use also use them as secondary hunting weapons - though not great for pursuing fleeing animals, they're useful for beating down or slaying already dazed smaller prey. Archer Archetype: Having a high archery skill and good quality bow and arrows can prove useful for ranged hunting and in ranged combat. They aren't a flawless method, though, nor necessarily the strongest or only method of active hunting. Also, Bow and Sword, in Accord characters are actually averted for the most part, given that all of the swords in the game are rare and expensive items. "Bow and Axe in Accord" or "Bow and Spear in Accord" would be a more fitting description. Art Evolution: Since 1992, the game has gone from ASCI "graphics" to very simple drawn graphics and sprites, to increasingly sophisticated ones, with more terrain and object variations, etc. The latest, post-3.30 releases have overhauled the NPC and object graphics and made several important updates to the lighting effects, even though the game is still a graphically lightweight 2D roguelike. Compare the screenshots of older versions with this ◊ or this one ◊ from the most recent release, and the gradual improvement of the graphics and their details is palpable. Back Stab: All characters and creatures have a 180° field of vision, and it's impossible to dodge attacks coming from outside that range. Bears Are Bad News: This game is realistic, so, bears are not to be taken lightly. They were feared and revered in ancient Finnish folkore and mythology for a reason. Berserk Button: Throw a rock at a villager, and the whole village will immediately hunt you down and slay you. The Njerpez seem to go berserk at any life-form other than themselves. Boring, but Practical: Sure, items like swords, mail armour, lamellar amour, maces, iron broadheads and simple crossbows all sound awesome, but they're rare, expensive, generally hard to come by. Knives, axes, bows and spears have you covered in most situations when you need to work, hunt, fight, or all three to varying degrees. Many of the seemingly unremarkable tools that the player takes for granted can also prove indispensible or real life-savers. Just ask any Unreal World veteran on how well they'd do without a fishing rod, nets, or a shovel. Among the buildings, the humble cellar is a simple, but highly useful structure, allowing for longer-term (but not infinite) preservation of perishable food and other supplies. Bottomless Bladder: The need to use the restroom or iron-age equivalent is one of the few things not in the game. Bottomless Quivers / Infinite Supplies: Forget it ! Even crafting the most ordinary, weakest arrow requires you to gather basic resources for its shaft, fletching and some tying material to put it all together. Once you shoot that arrow and it gets damaged beyond repair or reasonable retrieval, you'll simply have to manufacture another arrow. Each and every one of them, in fact. And that's not even getting into the necessary daily routine of gathering basic supplies like firewood, basic food like fish or berries, and other items you need to stockpile, depending on the season. Luckily, things get easier as your character builds up their housing and supply-gathering infrastructure and gains experience along with the player. Call to Adventure: You can give this to others (a generous amount of food helps sweeten the deal). Canine Companion: You can have many of them, and they are very effective fighters. Creator Provincialism: A healthy dose of it, in a very smart and positive way. The two devs behind the game, Sami Maaranen and Erkka Lehmus, share a life-long interest in historical crafts and archery, early Fennoscandian history, Finnish archaeology and ethnography, in addition to home-brewn game development. After just a few years of working on the initial Standard Fantasy Setting version of Unreal World, they decided to change the entire setting in the mid 1990s to a Finnish-themed one, and ever since then, have focused on increasing immersion into the semi-historical Finnish-style setting. Critical Existence Failure: Not quite! Any damage, including minor cuts and bruises, causes stacking penalties to combat and other actions. Limb damage will inhibit walking or weapon-use. Severe eye damage will actually reduce your field of view until healed. All of this affects your character, but can be exploited on your enemies, too. It's much easier to deliver a killing strike to the head after a foe's torso is battered a bit, and a game animal will have a difficult time escaping after an arrow has skewered its leg. Damage takes several days and repeated care to heal, and very severe wounds can worsen if mistreated or left alone. Earth Drift: Actually inverted during the game's long and patient development history. When home-brewn development began in the early 90s, the game had a more typical fantasy setting, but the devs decided to switch to a more original "ancient Finnish wilderness" idea around the mid 1990s. Though this shift was gradual, the game gravitated towards a more realistic, more semi-historical setting already twenty years ago. The setting itself is a Fictional Earth take on Fennoscandia centuries before the early Middle Ages arrived to that part of the world. Edutainment Game: Not overtly, but a lot of attention has been payed towards a plausible portrayal of Iron Age prehistory in a Finnish-style setting, based on known archaeological and historical evidence. You can learn quite a few things about daily survival and chores in a northern European Iron Age society. Some older versions of the game even saw domestic releases on CD for Finnish libraries and schools, as an interactive learning tool. Exactly What It Says on the Tin: The Islanders live on islands. The Owl-Tribe is good at moving around in trees. The Seal-Tribe lives on the northern ice. The Kuikka -Tribe is aquatic. Eye Scream: It's possible to take an arrow in the eye and lose vision in it. Luckily, the game isn't quite so realistic that you can't make a full recovery after a few weeks. Fantasy Counterpart Culture: Every tribe represents some historical group or region of people living in iron-age Finland. The northern cultures and some of the technology (e.g. kota huts) are inspired mainly by the Sami, the western cultures reflect the more advanced cultures of the old Finnish southwest, and so on. Averted for the Njerpez, who are generic "foreign invaders" and do not represent any specific people. The devs explain their approach to the game's fictionalised versions of historical/cultural group more closely in this article . The Greatest History Never Told: "Iron Age almost-Finland" is not exactly a common premise for a roguelike, or sim, or any game for that matter. The unique, fairly niche setting and the devs' great attention to detail are part of the game's appeal. Groin Attack: One of the possible hit locations. Guilt-Free Extermination War: This is basically in effect against the Njerpez, until they are given deeper motivations in the future. I'm a Humanitarian: Nobody bats an eye at human flesh and fat. In older versions, this was a laughably easy source of food, as any non-Njerpez alone in the wilderness will not expect the first strike from you. Nowadays, you can only butcher a human when you are legitimately starving to death, and you cannot make human skin into leather or fur. Karma Meter: Your relationship with the spirits is important: demand too much from them without giving anything in return and your life will become interesting at night. Low Fantasy: Explicitly described as such by its developers, including in official interviews . The only overt fantasy element is the fictional geography (though still based on Finland) and some of the Maybe Magic, Maybe Mundane supernatural elements involving various rituals available to the player. The Marvelous Deer: Yep, great stags are in the game. There are both male and female elks (mooses to North Americans), wild and tamed reindeer. Medieval Prehistory: Played with, in a more plausible way. This is set in a world inspired by late prehistoric and ancient Scandinavia, so there are already things like swords, mail armour and iron axes, but at the same time, all of these items are the most expensive and rarest in the whole setting, as iron tools are still a precious and valued rarity, even among the more developed cultures that trade abroad. Though there are larger villages and some of them are occassionally lightly fortified, there are no towns or urban society yet, no feudalism, no real nobility and no coin currency. It's a setting of fairly advanced cultures, but still largelly a primordial northern wilderness where the only abundant resources are those found in forests and lakes. A player character can own a few iron tools if they want, but can still live a lifestyle not too different from that of the Neolithic or Bronze Age. Due to The Greatest History Never Told nature of the chosen setting, many people seem to confuse the game for a medieval one, but it's better described as set in late antiquity or the Migration Era early Middle Ages, just in the far north. The Driikiläiset culture of the southwest is the most proto-medieval. All of the animals and plants appearing in the game also exist in the current world, and any fanciful extinct megafauna is avoided entirely. Motor Mouth: The sound effects for rituals are of someone talking very fast. Non-Lethal K.O. : Blunt arrows don't damage the flesh and skin of their animal targets, making them good for dazing various small prey. Hunting - whether animals or Njerpez - takes quite a bit of practice to accomplish without getting killed. The "Runaway Slave" starting scenario. All you've got is a few pieces of clothing and a knife. And you start in the middle of a Njerpez camp. Each of them is more heavily armed than you are. Good luck, you'll need it. If that's still not enough for you, try starting it in winter. "Hurt, Helpless, and Afraid". Same items as the above scenario, only you now also have a random collection of injuries ranging from bruises to broken ribs. Even more so, the Njerpez who did it to you have long since left; unlike the Runaway Slave scenario, where a very skilled player can kill one Njerpez, take his weapon, and use it to eliminate the rest one at a time in order to accumulate the entire wealth of their camp, there is no corresponding guaranteed boon of raiders to raid, even if your injuries permitted it. Best of fortune should you start this scenario in the dead of winter and end up with a bad arm injury. Optional Stealth: Hiding is one of many tools for a hunter or anti-Njerpez crusader. Panthera Awesome: The Lynx can be quite dangerous if cornered or provoked, and wounds caused by their claws have a nasty tendency to bleed. However, this is nothing compared to the earlier versions of the game, where it was by far the most dangerous animal in the game, was very aggressive, and could kill most characters with just 1-2 hits. Pit Trap: You can build these. Planet of Hats: Each tribe has a special hat. For example, the Kaumo are tough hunters, the Driik are physically-frail proto-town builders, the Owl-Tribe are good at herding reindeer and climbing, the Njerpez are violent slavers, etc. Practical Currency: There is no money in the game, but everything does have a set trade value (invisible to the player) based on rarity and utility. Arrows, good meat, furs, and iron weapons and armor are the items most desired by NPCs. An enterprising player can also construct dozens of "käpälälauta " fox traps, as their only material component comes from any large tree. Rock Beats Laser: Quite literally. Throwing rocks isn't the best ranged hunting or ranged self-defence method, but if you have nothing better at hand, ubiquitous rocks can come in fairly handy as improvised throwing weapons, especially within short distances. Seldom-Seen Species: One of the few games to feature grouses, relatively typical wildfowl of many forested areas, and in several species, at that (the capercaillie , hazel grouse , black grouse , etc.). There are also some waterfowl species that aren't seen that often in the gaming medium, such as north European loons, or birds of prey like goshawks. Though the mammalian species and plant species tend to be more popularly recognisible choices, some small carnivores like weasels, stoats ("ermines") and martens, and some of the herb and marsh plant species and most mushroom species, are a fairly rare sight in most games that feature wilderness. Self-Imposed Challenge: Lots of them. Some of the inspiration for the tone of the setting and its mythical and cultural aspects is inspired by The Kalevala, as well as other collected Finnish myth and folklore. 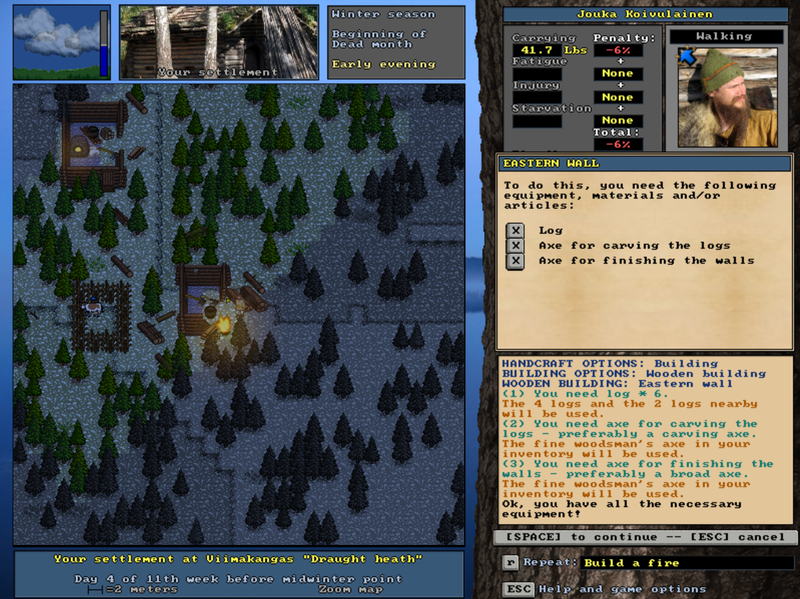 One of the available starting scenarios, which has the player starting off with an animal companion, is called "Not All Who Wander are Lost ". Fittingly, Tolkien was a big fan of The Kalevala and Finnish folklore and myths in general. Shown Their Work: The game is extremely realistic and has many touches and flourishes that are there just because they existed in historical Finland. Snow Means Death: Winter is unsurprisingly the harshest season in the game, and players are encouraged to prepair for it well in advance, stockpiling preservable supplies, building more permanent dwellings with heat sources, etc. Walking in deep snow causes a character to get fatigued more quickly, and just walking outside in the cold for prolonged periods can have repercussions on the character's health. The snow might not kill you by itself, but if you don't have adequate clothing and other survival measures ready, winter can be overbearing and easily weaken your character, until they can no longer struggle on. Even water is harder to come by in winter, as most inland sources of water completely freeze over'' and the player has to create holes in the ice to even access fresh water for drinking or fishing. Forget about robbers, raiders or wildlife being your main enemy in the game - it's the elements, and especially a season like winter ! Spikes of Doom: You can build traps with these. Sprint Meter: Quite important, as it affects all skill checks. It is also used up by attacking and dodging, and the max value is lowered by any injury. Throwing Your Sword Always Works: Averted completely. Swords are actually some of the few weapons in the game that can't be thrown at all, whether well or badly. Shooting arrows, throwing javelins, spears, throwing axes, or even just rocks, clubs or stakes are all more dependable methods. The player character can also throw knives, but this is discouraged, as knives can get easily damaged from the process and they're overly valuable tools to waste so easily. Vision Quest: Very simple ones: you wake up feeling like a ritual has entered your mind, and then you go learn the details from a sage. Welcome to Corneria: Dialogue is quite limited at the moment. 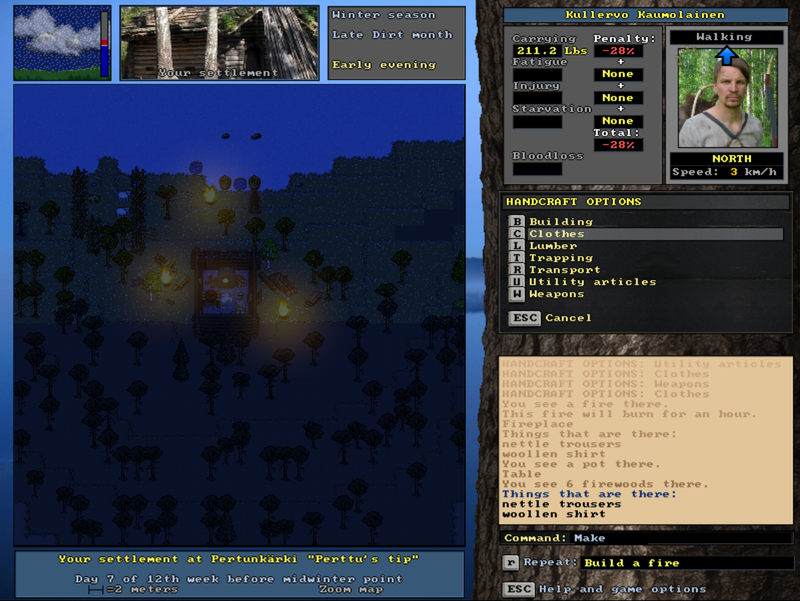 Wide Open Sandbox: You can do pretty much what you want: explore the wilderness, go hunting (active with weapons or passive with traps) or fishing, attack Njerpez, build a house, start a farm, trade with villagers, and otherwise live the life in ancient Finland. In an old version of the game, you could also get married. You Killed My Father: Involved in some of the possible backstories for your character.